Batavia, New York, sits midway between Buffalo and Rochester along the busy New York State Thruway. Western New Yorkers know it best for its racetrack, Batavia Downs, a half-mile track that features live harness racing July through December. But I best know Batavia as the birthplace of Emory Upton, a Civil War officer whose name I evoke every time I take people across the battlefield at Spotsylvania Court House. When I tell Upton’s story, I make it a point to mention his hometown because it’s kind of in my neck of the woods. I feel a kind of residual hometown pride. I had never actually been to Batavia before last week, though, although the Thruway has taken me “thru,” as its name implies, on several occasions. I was there last week to speak to a room full of Civil War enthusiasts at Genessee Community College, situated atop a high open hilltop just outside of town. It was an artillerist’s dream, I imagined, had any artillerist a reason to set up cannons there. The campus buildings are all connected by hallways and corridors, which quickly told me something else about that wide, expansive hilltop. Such connections are a common defense mechanism against western New York winters. I suddenly envisioned bitter wind and thick layers of lake-effect snow. This spot seemed so Upton: cold, humorless, and perfect for artillery. A postwar photo of Emory Upton. Courtesy of the Library of Congress. Indeed, the 24-year-old colonel demonstrated that with his innovative tactics on May 10, 1864, at Spotsylvania, finally earning his stars. 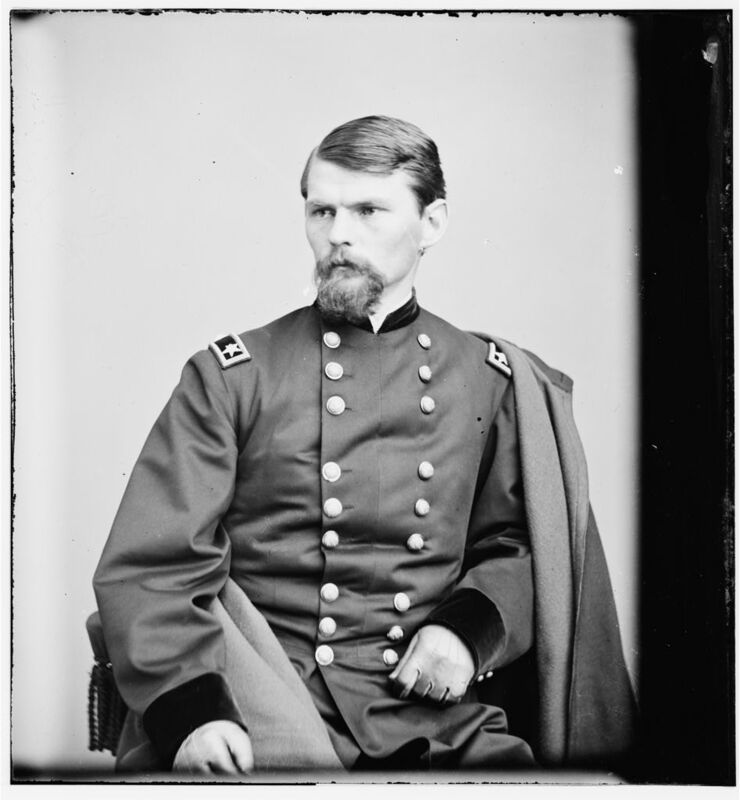 He demonstrated that, too, by commanding at various times during the war all three branches of the army (he finished the war, after being wounded several times, as a cavalry commander in the Military Division of the Mississippi). 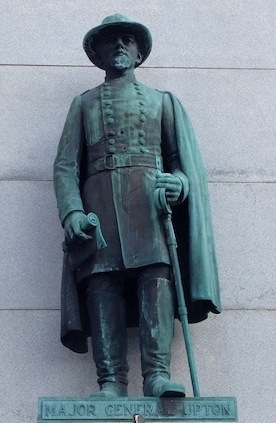 After the war, he served as commandant of cadet at West Point. Later, the army sent him to inspect military forces in Europe and Asia, bringing back sheaves of recommendations to modernize the U.S. army. He also began work on The Military Policy of the United States from 1775, a document that would remain unfinished at the time of his death but one that still had a major influence on army practices and reforms once it was posthumously published. Upton’s death came early. Suffering from debilitating migraines that might possibly have been the result of a brain tumor, toiling under acute depression after the untimely death of his wife, Upton committed suicide on March 15, 1881, by shooting himself in the head. He was, at the time, commander at the Presidio in San Francisco. His wife’s family had his body brought back to upstate New York; he is buried in Auburn. I was half-hoping I would run into Upton during my visit to Batavia, and so perhaps that’s why I spotted him so readily as I drove down West Main Street. 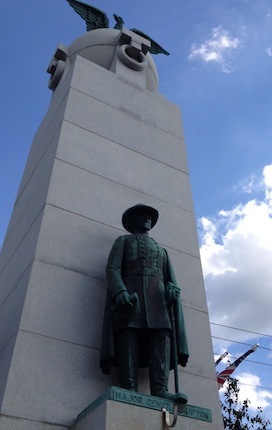 There he stood, cast in bronze, as part of the Soldier’s Memorial in front of the Genessee County courthouse. I passed by to the left but circled back on Court Street and found a parking spot along Ellicott. I wanted to get out and pay my respects. 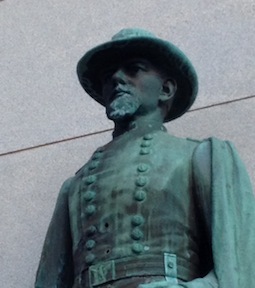 If a bronze statue could look stone faced, Upton’s did. I’m used to the stern but fresh-faced photo of Upton taken right after the war, but his statue depicts him in the full vigor of adulthood. He looks martial without looking noble, vigilant without looking bold. The weather has patinaed him just as sadness had in real life. Had I known Upton personally, I’m not even sure I would’ve liked him. He probably wouldn’t have liked me, either. I don’t mesh well with people who take themselves so seriously. But that doesn’t stop me from sharing his story, which is fascinating and surprising and tragic. I am proud to remember him. After I left Upton, I drove up to that high and lonely hilltop. Had Upton ever stood there? I suspect he would have liked it. This entry was posted in Leadership--Federal, Monuments, Personalities and tagged Batavia, Daniel Davis, Emory Upton, Kristopher White. Bookmark the permalink. Wonderful essay Chris. I’m in the middle of the Gordon Rhea overland campaign books and Upton stands out an innovative leader. Do you recommend the Ambrose bio? Any others worth checking out? Thank you for this story on Upton. He was every inch a soldier. I tell my wife and daughter the story of his breakthrough on May 10, 1864 every time we have the occasion to drive pass the monument.